Numerous specimen of the Strandbeest evolution on music of Khachaturian's Spartacus. It open the archives of fossils. Theo Jansen's work since 1990. He tries to make new forms of live on beaches. His animals get their energy from the wind so they don't have to eat. In the future he wants to put out in herds. My goodness the work that must go into each one of those, not to mention the difficulty of transportation. And then the potential for them end up in the sea or get damaged by the wind must be heartbreaking. I wonder what he does with them when they are finished after testing. My goodness the work that must go into each one of those, not to mention the difficulty of transportation. And then the potential for them end up in the sea or get damaged by the wind must be heartbreaking. I wonder what he does with them when they are finished after testing. Proble with the site Snotr I only pressed enter once honest!! I almost forget it's not a living thing. It moves like a wind creature. He looks like a proud Father in front of an infant taking it's first steps. Amazing! 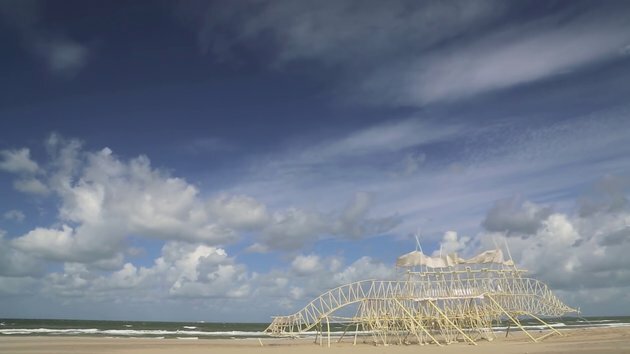 #8 hence name "strandbeest", if I got this one right it means: "beach beast". And yes I agree those look like living organisms. Superb!